Accurate Box Company has made an ongoing effort to be responsible stewards of the environment in Northern New Jersey and has taken steps to create more sustainable packaging for customers throughout North America. Accurate Box has made great strides towards adopting green policies, sustainable business processes and reducing the carbon imprint. Each year the sustainability team at Accurate Box sets environmental goals to become a more sustainable packaging supplier, not only by manufacturing products that are 100% recyclable, but by reducing its water and energy consumption. Corrugated materials are recycled more than any other packaging material. According to the Corrugated Packaging Alliance, corrugated is the most-recycled packaging material on earth, with a recovery rate of 92.9 percent in 2015. * By using recycled packaging and vegetable-based inks in the manufacturing process, Accurate Box is saving energy and water while reducing greenhouse gas emissions. 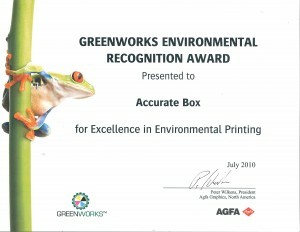 All corrugated materials manufactured by Accurate Box Company are renewable and sustainable products. By making stronger boxes and using fewer materials, customers are able to cut down or eliminate secondary packaging. All boxes manufactured at Accurate Box contain recycled content, however the percentage of recycled material used in the manufacturing process is dependent upon customer’s request as all orders are custom. Stronger, lighter boxes using less material. A high graphics corrugated box contains 15 percent less fiber than cartons. A carton made from 30 point virgin SUS board has a normal basis weight of 114 pounds whereas a high graphics corrugated box has a normal basis weight of 97 pounds consisting of a top sheet, medium, and liner. This equates to a 15 percent fiber reduction for corrugated boxes. In the case of recycled fiber, our boxes represent a 19 percent fiber reduction. In house research and development department. The evaluation of new high performing and lightweight substrates occurs regularly at Accurate Box. Consistent testing of these materials allow Accurate Box to remain on the leading edge of environmental stewardship (fiber reduction and increased recyclables) without compromising customer product performance. Corrugated boxes can be used as primary packaging. Customers are able to cut down or eliminate secondary packaging by creating custom packaging specifically designed to fit items and eliminate excess packaging materials. All corrugated packaging manufactured by Accurate Box is eco-friendly and 100% recyclable. Accurate Box Company uses vegetable-based inks certified by the National Association of Printing Ink Manufacturers under the Bio-Derived Renewable Content Certification Program. In vegetable-based inks, vegetable oil, such as soybean or corn oil, is substituted for petroleum as the pigment carrier, reducing the number of VOCs (volatile organic compounds) released into the air during printing. Accurate Box Company understands the importance of corrugated packaging distribution in the United States. Corrugated shipping materials are cost effective, lightweight, recyclable and versatile. Additionally, the location of Accurate Box allows the company to competitively take advantage of back-haul rates without adding to the carbon footprint. Every June, Accurate Box Company reports to the Carbon Disclosure Project (CDP) to track its carbon footprint and find new ways to reduce it. The report provides data and outlines CDP programs launched by the Accurate Box Corporate Sustainability Team. Logistics: Accurate Box’s east coast location and long term relationships with logistics providers permits Accurate Box to arrange competitive back-haul rates to customer locations, thus avoiding incremental CO2’s from emitting into the atmosphere. Palletization and Structural Design: The structural design and estimating departments regularly evaluate orders for efficiency. The teams consider the layout of the structures and analyze reformatting options to reduce the amount of paperboard used to create the structure, or to maximize the amount of product when stacked on a pallet. Under the company’s environmental policy, all paper suppliers are required to be certified by the Sustainable Forestry Initiative (SFI), Forest Stewardship Council (FSC) and/or Programme for the Endorsement of Forest Certification (PEFC). SFI and PEFC participants are committed to maintaining, overseeing and improving sustainable forest lands. Growing and harvesting allows younger, stronger trees to blossom and working forests also provide jobs to stimulate the economy. Accurate Box measures and discloses greenhouse gas emissions to CDP and devotes resources to constantly reducing its carbon footprint. As new technology emerges in the marketplace, Accurate Box frequently purchases more efficient equipment to conserve energy. These initiatives include the replacement of gas powered forklifts with battery operated forklifts. In March 2017, Accurate Box completed the installation of over 500+ LED light fixtures which replaced the previously used fluorescent lighting. The switch is expected to reduce lighting energy consumption by as much as 51%. Water usage has been significantly reduced over the past 5 years.